Geek Deal of the Day! ‘The Godfather’ Blu-ray Movie Set!!! Only $16.99!!! Here is one hell of a geek deal. ’The Godfather’ Trilogy for only $16.99 It normally sells forway more than that, but now through us and AMAZON, get it for only $16.99. Now I know Godfather III gets a bad rap, and it is nowhere near the quality of the third film, but compared to most trilogies or even movies, Godfather III is pretty great. This is the cheapest EVER! Take advantage on this AWESOME deal for it won’t last long. Until midnight to be exact. Stock up on holiday presents, birthdays, or a special gift for yourself. $16.99 for all Godfather films. Geek Deal of the Day!!! 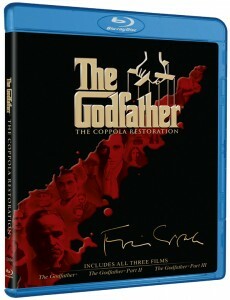 ‘The Godfather Trilogy on Bluray!!! 60% Off!!! Only $25.00!!! Cheapest ‘Godfather’ Ever!!! This entry was posted on Tuesday, November 20th, 2012 at 5:03 pm	and is filed under Film, News. You can follow any responses to this entry through the RSS 2.0 feed. You can skip to the end and leave a response. Pinging is currently not allowed. « ‘Insidious 2’ Is Happening!! !